Anonymous and the People’s Liberation Front have launched a “totally secure and safe alternative” to Pastebin, the site used by the hacktivist collective to dump data recovered from hacks. AnonPaste for people to post uncensored documents and files without compromising their identities. Shared content can be set to expire after 10 minutes, an hour, a day, a month, a year, or never. In addition, the site promises to remain advertising-free and unmoderated, maintain no connection logs, and store only encrypted data. The two groups said AnonPaste offers 256-bit AES encryption at the browser layer. AnonPaste supports a URL shortening feature and allows users to post up to 2MB of text snippets at a time. Users can specify how long they want the text to remain available on the site. AnonPaste, which accepts donations via WePay and BitCoins, was built using the open source ZeroBin software, which doesn't record the IP addresses of uploaders. 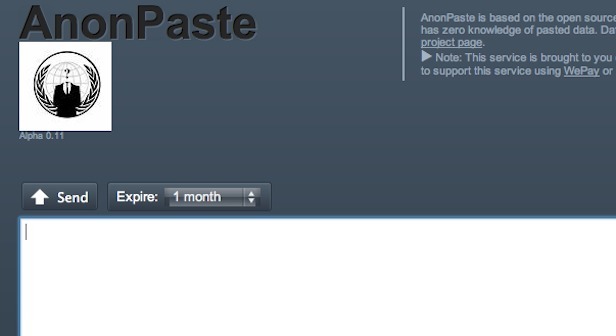 Anonymous and the People's Liberation Front said AnonPaste was launched after learning that Pastebin.com may move to censor content and pass on the IP addresses of people posting on its site to law enforcement authorities.